My days as an artist started by accident while writing a children’s book. The quest to write a unique children’s book started by creating a story based upon mazes. The book contained 20 mazes and in my attempt to make increasingly more difficult mazes, a more artistic look to the work emerged. Seeing the beauty and hidden designs within each maze mixed with positive feedback from others I began more experimentation drawing mazes adding dimension. These early attempts really brought life to the mazes almost completely disguising them inside the work. My medium of choice is pencil, pens and ink, with the goal to add painting and wood-burning to my skill set. I create on any surface ranging from paper to canvass. A certified dumpster diver I like to use recycled materials from wood to tiles including the framed portion of the presentation. I repeat the theme of the maze in all of my work for two reasons. First, I see the maze as a strong metaphor for life. The maze is beautiful as a whole but is created from several pieces that form a journey. A journey that similar to life is full of obstacles and dead ends but contains a solution. Getting to that solution, that finished piece, inspires me as a entrepreneur, writer, father and coach to continue to take action in my life toward dreaming reality no matter how many dead ends I encounter. The second reason for repeating the maze theme is the quest to create a harder maze with each new piece. The early work was limited to shapes. 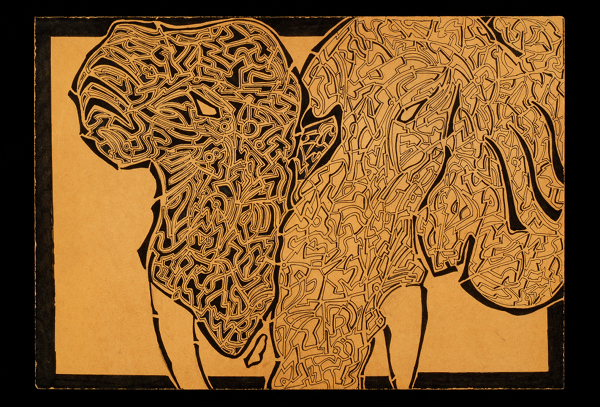 As my skills increased with depth, angles and perception, I challenged myself to draw more detailed subjects like elephants. Simply put I want to see where I can take it. A virtually untapped style of drawing the maze provides an endless number of possibilities to explore from an artistic standpoint. My long term goal is to develop a style that continues to use the maze with the ability to completely disguise it within the work.